I think that a cute little puffy bunny is such a sweet gift, so make some for all your friends! 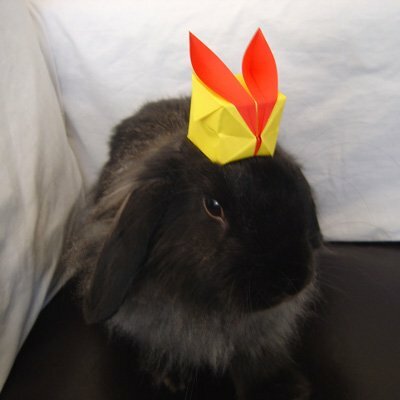 You can find the instructions to make the puffy bunny here. I've also made a video of how to make the puffy bunny... and to get a chocolate Easter egg inside it! It's a bit fiddly, but not too hard. It's well worth it, because what a gorgeous Easter gift to give someone! How to Fold an Easter Bunny with an Easter Egg Inside! 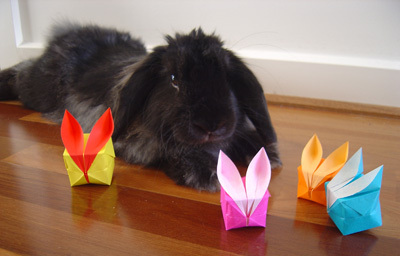 Well, I use origami boxes for everything… and Easter eggs are no exception! 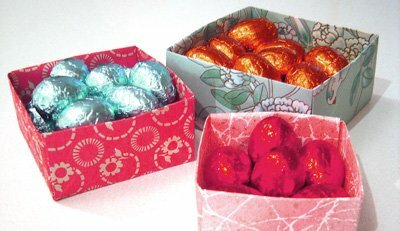 These boxes are great for sitting on the table filled with little Easter eggs, or make another box for a lid, and give them as presents filled with eggs! 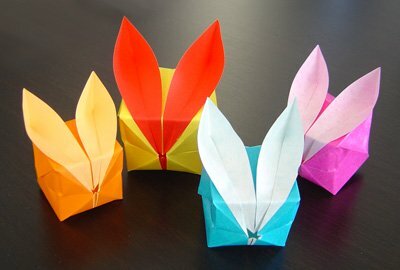 There are a few other great origami boxes that you can make that will look fantastic filled to the brim with chocolate Easter Eggs: Click here to see other types of origami boxes for Easter. I've made you guys some loooovely printable paper that you can download, print out and use to make these boxes, and bunnies if you like! Click the image below to download 5 designs in pdf (it's about 6 mb). Happy Easter from Moom and his Family!! !